Surf N Turf is located in Pismo Beach California about half way between San Francisco and Los Angeles at the Oceano Dunes State Vehicle Recreation Area. 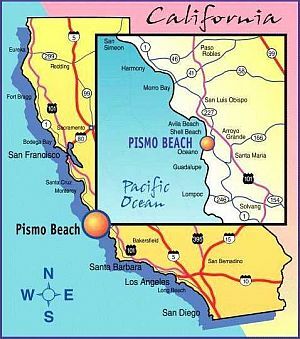 Also known as the Pismo Dunes, this 1,500 acre sand dune complex is geologically unique and also provides an impressive playground for off-highway enthusiasts from throughout the United States. It is one of several OHV areas administered by the California Department of Parks and Recreation. There are two entrances to the park, 1) Grand Avenue to the North and 2) Pier Avenue to the South, both turn off HWY 1. You can buy or pick up your camping pass at either kiosk. If you arrive late you may find the kiosks closed. Don't worry the Pier Avenue ramp is always open, just proceed to camp, first thing in the morning go back and get your pass. Drive onto the beach at the Pier Avenue ramp and turn South. We camp on the beach near Pole 6 about 3 miles South of the Pier Avenue entrance ramp. Follow the large numbered posts located on the beach every half mile. Look for the Surf N Turf banner and lots of Land Cruisers when you reach Pole 6. You can't miss us! Speed limit is 15 MPH on the beach and within 50' of any camp or group of people. California's Basic Speed Law applies in the dune area: Don't drive faster than is safe for conditions. Laws that pertain to driving under the influence of alcohol are exactly the same as they are for on-highway. Don't drink and drive. Laws are strictly enforced, please obey. The best way to find out more about the park rules is to check out the Oceano Dunes SVRA Rules and Regulations website or call the ranger station at (805) 473-7220. On Sunday many people leave the beach and head East into the nearby Santa Lucia Mountains. The goal is the historic Pozo Saloon. Much of the route is a single lane dirt road through oak woodlands and over chaparral covered ridges. Pozo is about 30 miles from the beach. This is a fun and scenic drive through lush canyons and steep mountains. 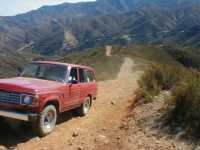 Along the way, you'll pass the optional Garcia Ridge 4WD trail as you climb from sea level over a 3,000-foot elevation ridge on the Pozo - Hi Mountain Road. At the top of the ridge, the Hi Mountain Lookout station provides views of the ocean, dunes and inland mountains. Plus, another 4WD trail, the Las Chiches trail, is located just North of Pozo. Maps of these trails will be available at the Surf N Turf camp. Allow about two hours for a leisurely pace to Pozo. From the beach, head East on Grand Avenue, cross over HWY 101 and follow the signs to Lopez Lake. At Lopez Lake take Pozo-Hi Mountain Road over the mountains to Pozo. From Pozo, it's a 25 minute drive back to HWY 101 via the town of Santa Margarita (just North of San Luis Obispo). These are informal runs, not guided trail runs. Please form you own groups. We will provide directions, maps and information at the Surf N Turf camp. The Garcia Ridge trail is a narrow, one way in and one way out trail. The trail is a designated OHV trail in the Los Padres National Forest. The best parts of this steep ridge route are near the beginning. The top of the 3,000-foot elevation ridge trail offers panoramic views of the ocean, dunes and inland valleys. This trail is steep and narrow but still suitable for stock vehicles. Optional challenge bypasses and some rock ledges will give you a chance to test your lockers. Allow about 1-1/2 hours to run the trail. The trail branches off the main road to Pozo. Please break into smaller groups and spread out a bit before hitting this optional inland trail. The Las Chiches trail is a steep, loose and narrow ridge top loop trail. The trail is a designated OHV trail in the Los Padres National Forest. The trail follws a ridge top with interesting geologic formations and panoramic views of the inland valleys. This trail is steep and loose but still suitable for stock vehicles. Allow about 1-1/2 hours to run the trail. The Las Chiches trail is about 20 minutes East from Pozo. Remember, you're on your own, these are not guided trail rides.